“A Jerusalem church in honor of the Mother of God was dedicated on this date in the sixth century. A century later, St Andrew of Crete mentions a yearly feast commemorating the entrance of the Theotokos into the Temple. “The details of the feast are drawn from the apocrypha, such as the Gospel of James, since canonical scripture has no account of the early life of Mary. The setting of the feast is in the temple rebuilt by Zerubabel,, which no longer contained the Ark of the Covenant. 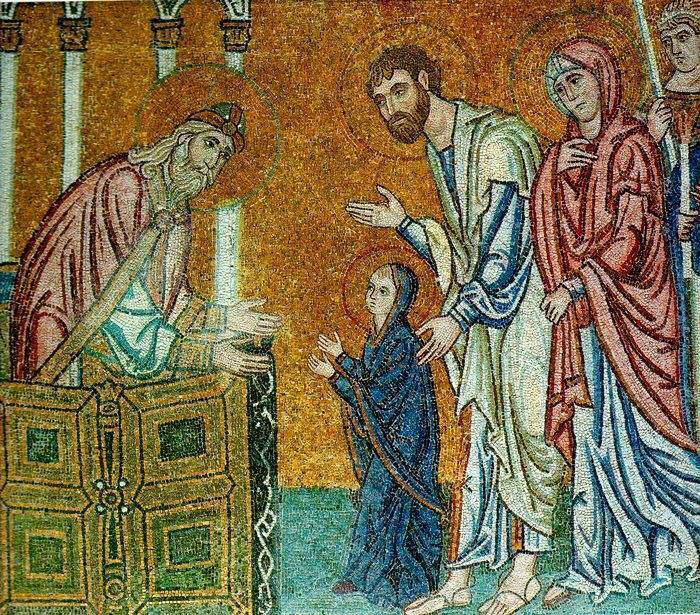 In the feast-day icon, the priest and prophet, Zecharaiah, father of John the Baptist, escorts the Virgin into the Holy of Holies. The Theotokos is thus received as the Living Ark, for in the fullness of time, God himself will come to dwell in her. “The feast, then, is another step in the preparation for the birth of Christ. What began as a legend has been used by the Church for centuries to emphasize the dedication of God’s Mother to service in the Lord’s house, to foretell to all the coming of Christ.